Last year when I drove the 109-horsepower Nissan Versa Note I thought I’d driven the slowest accelerating car made in the past 10 years, but that was before I’d driven the new Mitsubishi Mirage. This makes the pokey Versa Note feel frisky. 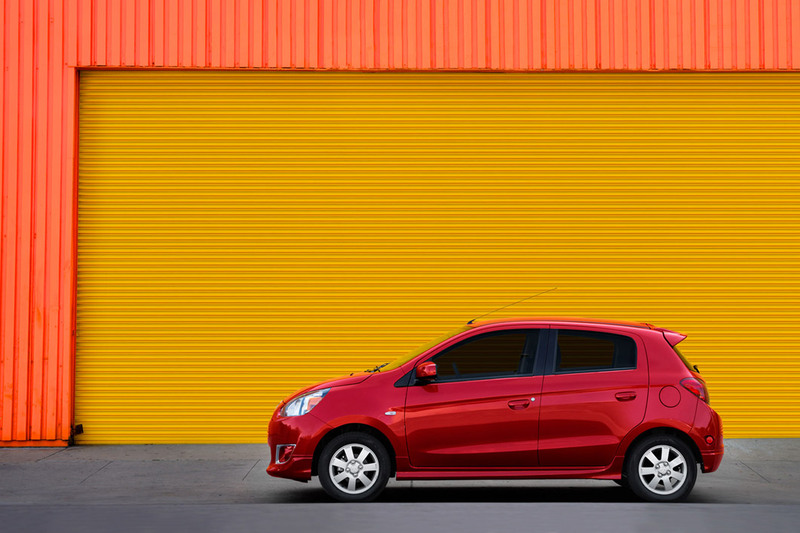 Mirage is a pleasant looking little hatchback designed top to bottom for the entry-level buyer who needs new wheels, but can’t afford much. It’s a small market segment, but let’s face it, there is a need for inexpensive entry-level economy cars. We’re not all rich, or even middle class, these days. I’m happy that such low cost economy models exist. But I really expect a new car to have enough power to get out of its own way, or at least that of the aging winter beater car that’s tailgating me. For the record Mirage has a 1.2-liter 3-cylinder engine that creates … wait for it … 74 horsepower. In short it’s slow to pull away from stoplights and requires quite a long run down an entry ramp to make it up to highway speeds. Under heavy acceleration the drivetrain groans considerably. Mentally, I was groaning too. The sparkling metallic red Mirage ES that I tested comes with a continuously variable transmission (CVT) that does the car no favor by seemingly hunting for the appropriate gear to pull the front-drive sedan up to normal driving speeds. The irony is that CVTs normally are super smooth shifting with infinite gear ratios so a car gets incredibly good gas mileage and smooth acceleration. Certainly that’s what you expect here with a 3-cylinder engine and a low-cost entry point of just $13,700 for the base DE model with a five-speed manual transmission. That model is rated at 34 mpg city and 42 mpg highway while the ES model is rated better at 37 mpg city and 44 highway due to that CVT. So fuel economy would seem a major plus. However, I got just 29.6 mpg in about 60% city driving, considerably lower than the EPA numbers would lead me to expect. By comparison, I got 31.9 mpg in the similarly sized Nissan Versa Note last year. Even a larger Nissan Sentra netted me 34.5 mpg in a test last year. The tested Mirage ES starts at $15,195, which is still easy on your bank account. Add in the $795 delivery charge and this car comes in under $16,000, a noteworthy achievement in today’s market. Sadly the performance reflects the price. In addition to weak power, Mirage also falls short in a other areas. Its ride is choppy. The wheelbase is a short 96.5 inches and the tires are 14-inchers. You feel every bump and expansion joint in the roads. There’s also a high-pitched wind hum once the car gets to about 40 mph. That appeared to be from the body or mirrors, not a window air leak. Handling is vague with more play in the wheel than you’d expect in a pre-schooler’s playground, or a small car. There’s also some lean in tight turns. A Mazda2, Hyundai Accent or Ford Fiesta have much more responsive steering, proving it CAN be done. Steering effort though is light and easy. The car feels equally light and the braking is fine, with discs up front and drums in back. Most cars now have discs all around, but this is one way to keep the car’s costs down. 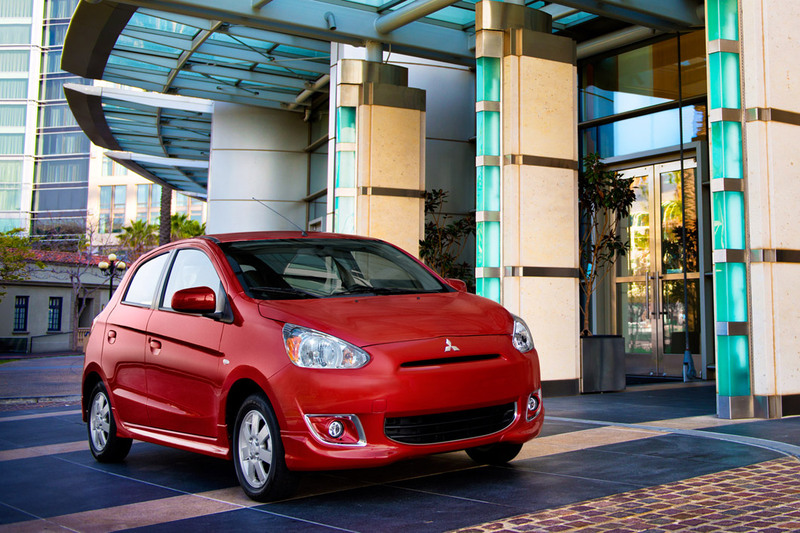 Mitsubishi does give the Mirage traction and stability control systems. While performance is as basic as a go-kart, the Mirage’s interior is well laid out and doesn’t feel or look as entry-level as the mechanicals indicate. 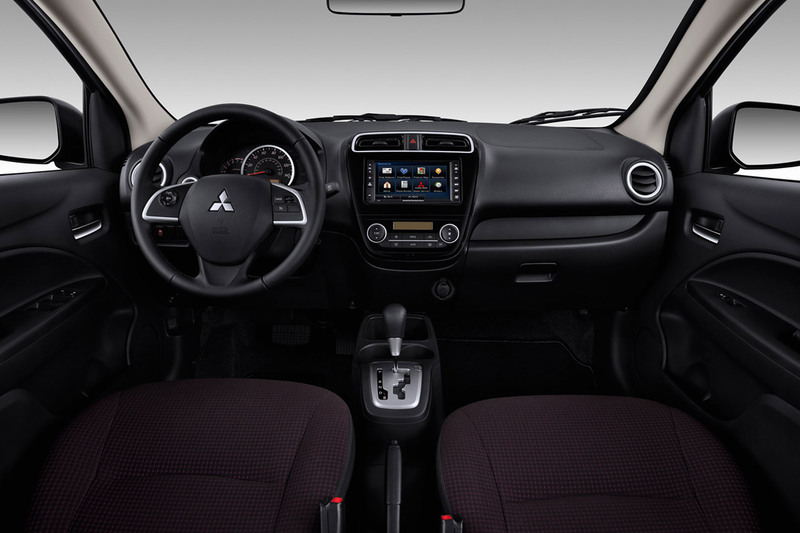 Performance may be lacking, but the Mirage has a darned nice dash layout. The test car’s dash is black textured plastic and there’s a gloss black surround on the center stack with matte silver trim by the shifter and on the tilt-only steering wheel’s hub. The wheel and shifter also are leather-wrapped. The test car’s seats were a black and purple cloth pattern that looked youthful, not cheap or tacky. Equipment is not bare bones either. There are radio, phone and cruise control buttons on the steering wheel hub and power mirror buttons on the dash’s left side. But what impressed me was the clean gauge and center stack design with a large 140-watt radio with big channel selection buttons and a big volume knob in the center. Some pricier cars could learn from this layout. Likewise the climate controls are large with automatic digital temperature control. Mirage’s seats are fairly flat, with mild contouring, and they are firm, as you’d expect. But I found them comfortable enough for city driving. I also liked the dial on the driver’s seat that raised and lowered that seat’s height. Despite the car’s small dimensions, head and legroom are good up front and moderate in back. If no one is exceedingly tall you can get four adults into the Mitsubishi for city drives. 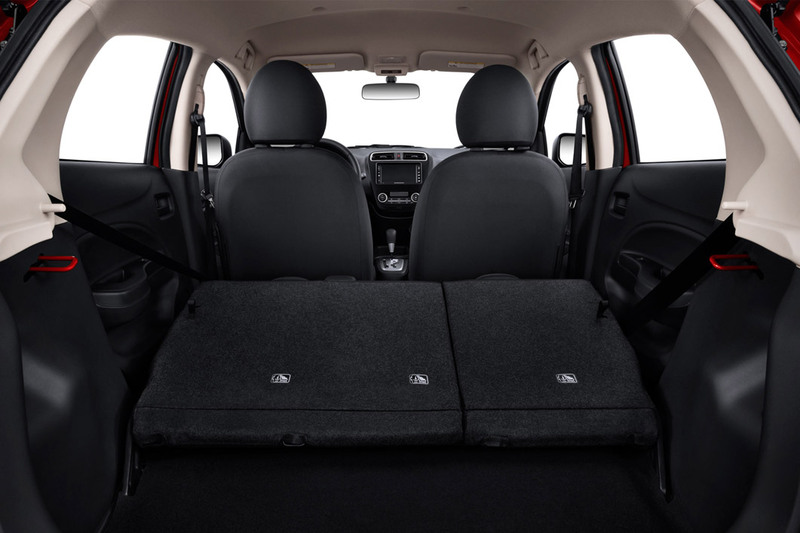 Certainly there’s good storage behind the rear seat as the cargo area under the hatch measures 17.2 cubic feet. The rear seats also split and fold nearly flat, but you must release the seat backs from the back. So you have to open the hatch to lower them. I also like that there’s a wiper on the hatch window, a plus in our climate. Rear seats fold down, nearly flat. Other interior features include two cup holders between the front seats, plus an open box in front of the console’s gear shift lever. The headlights also turn off a few seconds after you shut off the car’s ignition and open the door, although there is a warning beep when you open the door. There’s also push-button start, but the button is somewhat awkwardly located on the dash’s left side, where you might expect a lights knob in an older car. Ironically there’s still a round plastic insert in the steering column where the old key-start ignition normally would be located. And the Mirage’s sun visors also feel flimsy and do not slide. Again, this is a basic bare bones car at a low price and one that’s aimed at first-time buyers who need economy more than anything else. 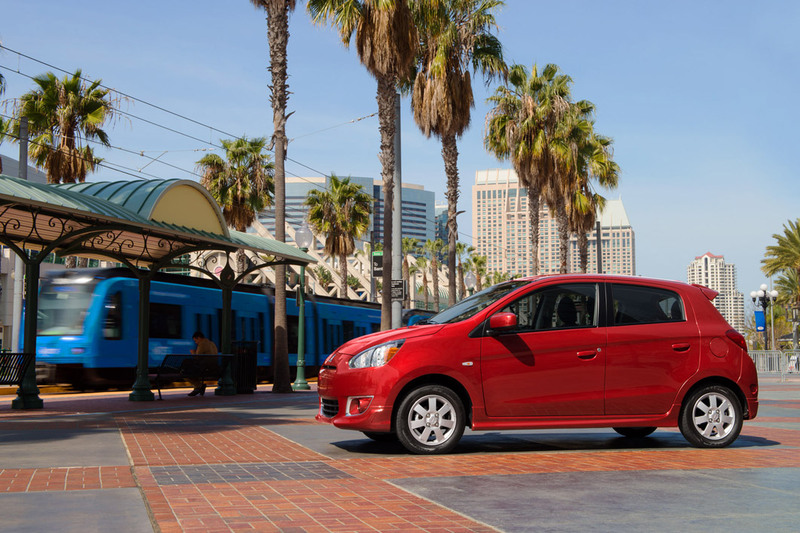 Be aware there are several other low-cost small cars on the market, so drive them all before making your econo choice, or look for a good used car. Hits: Low price, potentially good gas mileage, nice interior with well laid out dash and big buttons. Hatch design creates large useful cargo area and there’s a rear window wiper. Misses: Low power, CVT doesn’t offer much low-end help, ride is choppy and handling vague, but light. Start/stop button awkwardly on left side of steering wheel. Sun visors feel flimsy and there’s a persistent high-pitched wind noise at speed.